Resources for parents with autistic children. Update May 9, 2014: Wolfgang Halbig appeared at the Newtown School Board meeting on May 6, 2014. In as much as Halbig has been in the educational field for the last few decades, he should be aware of how a school board functions and exactly what it has jurisdiction over and what it does not. It is incredible that he expected to obtain documents or answers to his 16 questions from a group of citizens who compose the school board who had nothing to do with the internal workings of a Connecticut State Police or Newtown police investigation. We all want the truth and that comes from hard evidence, not speculation about Christmas trees and other nonsense. Halbig's 16 questions have been answered numerous times, in the official reports, on my radio program and at this site. Did Halbig visit Newtown to justify/spend the donations that he had received from hopeful truth seekers. Why would Halbig expect officials to answer questions that were already addressed in the official reports? He claims to have read them but discourages others from looking at them. Are people just supposed to take his word for what is in the reports? The United Way posts all of its disbursements online. The denialists did not need to visit the UW office to get the information. Both Halbig and Fetzer apparently feel that their trip was successful. If that is the case, given that no one answered the 16 questions, why would they consider it a success unless they really went there just to attract negative media/police attention so that they could claim that they were thwarted. That is not evidence of a conspiracy. It is just the reasonable response of the Newtown residents who have been accused of being liars and actors who have executed a horrible hoax on the whole country. That is the character assassination of almost 30,000 people. Fetzer and Halbig were bound to provoke some stoic New Englander who would cuss and lay hands on Halbig so he could file an assault and battery charge. How does any of that assist him in his alleged quest for the truth? It just makes him a victim and maybe, in his mind, gives him credibility. He and Fetzer will use the trip to bolster the claim that SH was a hoax. One must ask who has really executed a hoax and on whom? It took several agencies months and months to investigate and collect data yet Halbig and Fetzer planned to solve the mystery in just over twenty-four hours. Did they go to Newtown to investigate the crime or aggravate the townspeople. They took their own film crew to record that predictable anger so they could use it as some kind of proof of a hoax. If a reasonable individual were going to investigate this event, he/she would first go to the city clerk and obtain death records. The United Way records are public and are posted online. Next, he/she would go to the cemetery to see the graves, and then he/she would talk with the record keeper at the cemetery and ask to see the records of burial. Next, he/she would visit the mortician who says that his facility handled eleven of the bodies, which Halbig admitted to on my radio program on March 4, 2014. Fetzer and Halbig should have visited the town clerk to look at the land records to ascertain if the people involved in Sandy Hook received free homes, a claim that some hoaxers have made. When I looked at those records, when they were available online, I found that each and every one of them had a mortgage and to whom they paid the monthly payment. An opportunistic person (con man) just has to have an explosive, emotional cause and the appropriate connections in the "truth movement" to get on some well-known radio programs where he/she can claim that the government is trying to silence him/her. Playing the proverbial victim card, Halbig gained sympathy, collected thousands of dollars from people who are now emotionally and financially invested in a cause. Now, Halbig, who failed to establish a legitimate, long-term school safety business, really is nationally known, not as a school safety expert but as a very vocal, compulsive Sandy Hook hoaxer. What he currently needs is a ghost writer to compensate for his poor grammar, to create some credible not-already-answered questions, and to legitimize his resume. He claims that he is in charge of Risk Management for the Lake County School District (2005 to current). The fact is that Superintendent Susan Moxley did not re-new his contract in 2009. I would like to see some certification from Abilene Christian University for that BS degree or does that mean something else in his case? Fetzer, who cannot count and Halbig, who cannot write, should make quite an impression on the Newtown School Board. It appears that Halbig, since the release of the report, has attempted to distract people from actually reading the report. Within twelve hours of its release, he began posting messages, encouraging people to focus on other issues. Similar to my posting about his comment from July 2012, some very influential entity has also removed the noted incriminating posts. My question to Halbig, why don't you want people to read the report? Shouldn't people investigate for themselves instead of relying on someone else to tell them what to think? Halbig denigrates the report by calling it a data-dump which discourages people from looking at it. Update: March 13, 2014: Wolfgang Halbig has a new web site, Sandy Hook Justice, on which he asks sixteen questions, most of which have already been answered. He also asks for donations as he is apparently attempting to raise $100,000 to hire a lawyer. 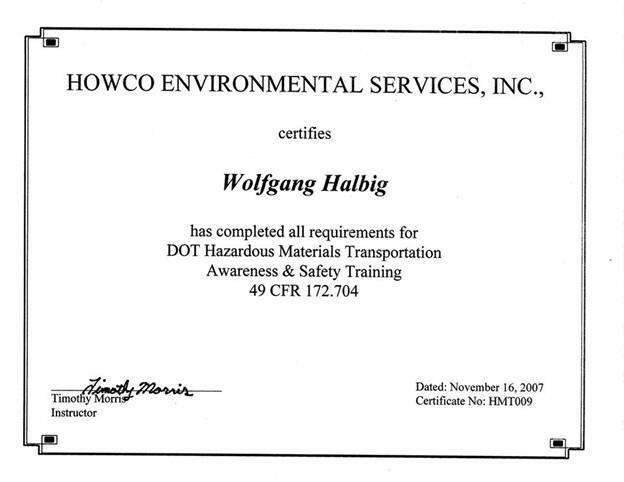 On his new web site, he said, "Wolfgang Halbig has recently formed a new safety and security company, WK & Associates." However, an Internet search indicates that Halbig started this company in 1999 while other Internet records indicate that he started this company on October 21, 2004. He made a contribution to the Republican Party as a partner of Wk & Associates Inc. in 2004 so we know that the company existed then; then how can it be a "new safety and security company in 2014? 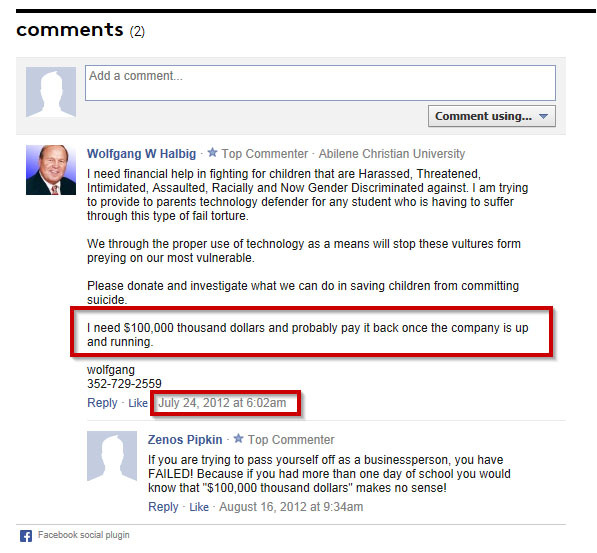 One may also find mention of yet another company, Bullies Beware, Inc., that Halbig started on September 24, 2009. Halbig's website, Children’s Safety Institute is now defunct. On his Face Book page (now defunct) he claimed that he was fired for questioning Sandy Hook. How can one be fired from a website-based business whose phone went directly to his home? He said that his partner quit his job because of Halbig's activities. Halbig has been asking questions about Sandy Hook for about a year. Didn't his "partner," whoever that is, know about this before now? Halbig took down his web site just three days after I questioned the validity of his business on my radio program on March 4. Poseidon points out (see below) that two of Halbig's references on his website were dead before Halbig even created his site. If he fabricated false references, how are people to trust him or seriously accept anything that he says? Did he also fabricate the story about the local "homicide" detectives and the sheriff's deputies coming to his house to threaten him? He has questioned the behavior and accused the Newtown police officials of dereliction of duty yet he does not say anything about the local police and sheriff's deputies who seem to be harassing him? ONE OF MY BEST BUSINESS PARTNER QUIT HIS JOB WITH THE CHILDRENS SAFETY INSTITUTE BECAUSE I AM INVOLVED AS HE SAY'S IN THIS CONSPIRACY THEORY ON SANDY HOOK AND IT IS NOT GOOD FOR OUR COMPANY SINCE I WAS TAKING DONATIONS WHICH HAS NOTHING TO DO WITH CSI. HE DOES NOT UNDERSTAND AND IT IS CONNECTED TO AUTISM. PEOPLE ARE AFRAID AND I CAN SEE WHY. HE IS THE KEY SO HE LEAVES AND NOW I HAVE LOST MY JOB BECAUSE WE ARE A TEAM. I AM FIRED BUT I MIGHT AS WELL BE BECAUSE WITHOUT HIM I HAVE LOST MY JOB BECAUSE OUR COMPANY IS A TEAM." In addition, the CSI seems to be nothing to do with regular school safety, and instead focuses on the safety of children with special needs, such as autistic children, and how to train teachers to handle potentially violent special-needs children. 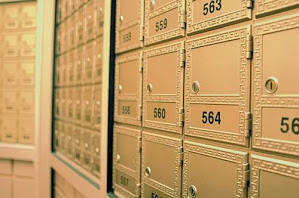 He said in the RBN interview that the address, 5703 Red Bug Lake Road Suite 103, was the address of the chief executive. Another of his references is Gloria Lunsford, of Raleigh, NC. “Gloria M Lunsford was born on December 20, 1948 and died on May 05, 2009 at the age of 60. Gloria last resided in Raleigh, North Carolina in Wake County. http://www.death-record.com/l/118779915/Gloria-M-Lunsford Halbig’s website domain was not created until October 29, 2012, more than a year after both of them were dead. Check out Halbig’s site at the Wayback Machine, and you find it’s only been saved once – on August 18, 2013, consistent with a website that wasn’t live until late in 2012. http://web.archive.org/web/*/http://childrenssafetyinstitute.com/ Clearly, after setting up his website, Halbig searched for dead people to use as fake references." Another of his references, Robert Logan, the Asheville, NC School Superintendent, was embroiled in a scandal in December 2011. The State auditor was recommending disciplinary action against Logan because the employment of the Associate Commissioner had been intentionally misrepresented in order to increase his retirement benefits. Thanks to Poseidon for his incredible research!!!! This Member is NOT currently an ACTIVE member. On my radio program he said that he paid the annual fee of $599 to be a member but did "not want to be listed." He said that he is not advertising that he is an expert witness which seems kind of odd in that he is claiming on numerous radio shows that he is a school safety expert and consutant. The Columbine shootings occurred on April 20, 1999. 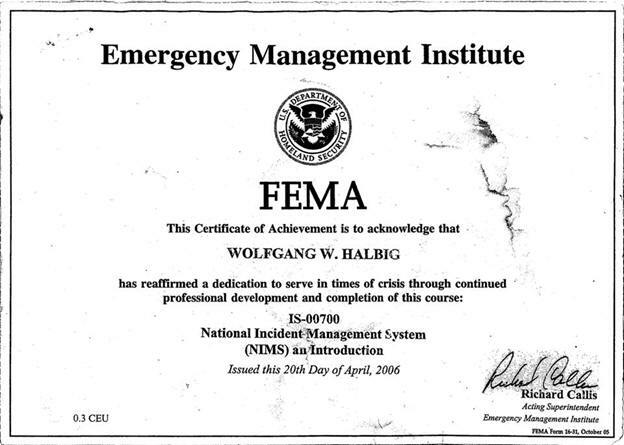 Halbig started and was the president and director of the National Safe School Institute, Inc. on August 13, 1999. He consulted the law offices of Frank Killgore, Craig Pearlman, Martin F. Stamp, and Mark Ornstein in Orlando to establish his for-profit corporation. Killgore, Pearlman, Stamp, Ornstein & Squires, P.A. 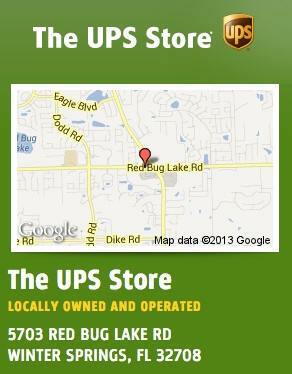 (law office) was still in business as of September 1, 2013. National Institute for School and Workplace Safety filed as a Domestic for Profit Corporation in the State of Florida and is no longer active. 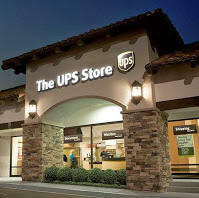 This corporate entity was recorded in documents filed with Florida Department of State. 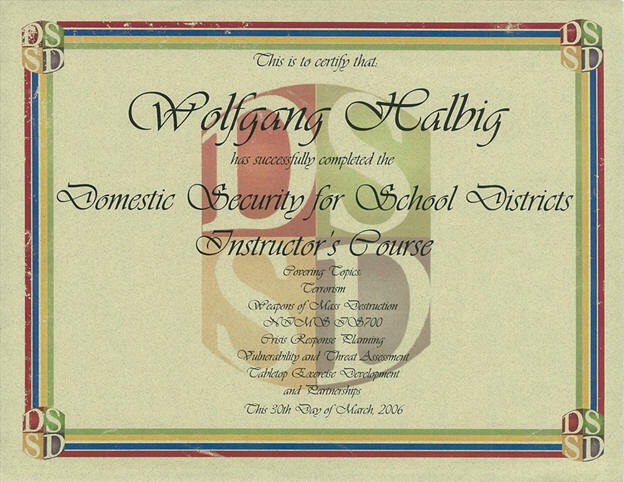 Wolfgang Halbig was the President of National Institute for School and Workplace Safe.